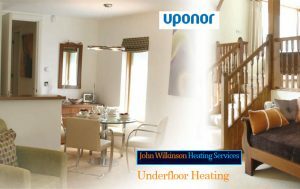 If you’re looking Underfloor Heating in Warrington or St Helens, John Wilkinson Heating Services are at your service! We are expert installers of underfloor heating systems. When thinking of the best quality underfloor heating, modern technology plays a huge part in what makes this not only a top quality product, but an efficient one too. And efficiency is at the core, with cost savings achieved due to the need for lower water temperatures when compared to radiators. An energy saving rate of between 15% and 40% is achieved compared to conventional heating methods. We fit Uponor products, widely considered to be the best available in this type of heating system. And also widely accepted as an economical solution. The heat is provided by a gas boiler and then sent through pipes which can be laid under existing floor-coverings . These pipes are extensively tested during manufacture, including pressure-testing, and again during installation. With Upon or Underfloor Heating there are no joints under the floor, because the pipe is laid in a continuous circuit. Upon or put the pipes through the highest possible quality control procedures, which include high-pressure tests for every metre of pipe they produce. So for the most economical solution to underfloor heating in Warrington and St Helens, get in touch today! By using underfloor heating as opposed to conventional radiators, there is also a saving on space. For those with allergies, dust mites can be reduced with underfloor heating due to the difference in moisture levels. And underfloor heating is much quieter than conventional radiators. Most types of floor coverings can be used with the underfloor heating, including tiles, vinyl, wood, stone and carpet. Heat rises of course – meaning with conventional radiators a lot of the heat is found at ceiling height. With underfloor heating the heat is where it’s needed, just above the level of the floor, meaning less waste and less loss through open doors. 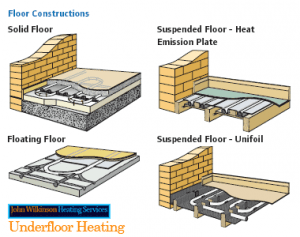 Underfloor heating can be fitted to old or new buildings, and can be fitted on most types of floor surface. Please contact us for more details on underfloor heating in Warrington, St Helens or further afield.